Did you ever have a rag doll when you were growing up? Did you ever wonder what kinds of adventures they got into while you weren't looking? Well, you don't have to wonder any longer, since you can dress up as your favorite childhood companion in this cheerful Plus Size Rag Doll Costume, and see what kinds of fun you uncover! Let's face it, we're all adults here (or at least, our boss keeps telling us we are), and believing that our toys came to life and went on epic quests in our houses when we were at school or dozing away in our beds when we were little is absolutely preposterous! But... come on, does anyone really know? Just like refrigerator lights, we have no clue what toys are up to when we aren't looking right at them, which is what makes dressing up like a cute, raggedy doll so much fun. You get to use your imagination and think of all the silly adventures a doll would get into once they spring to life! 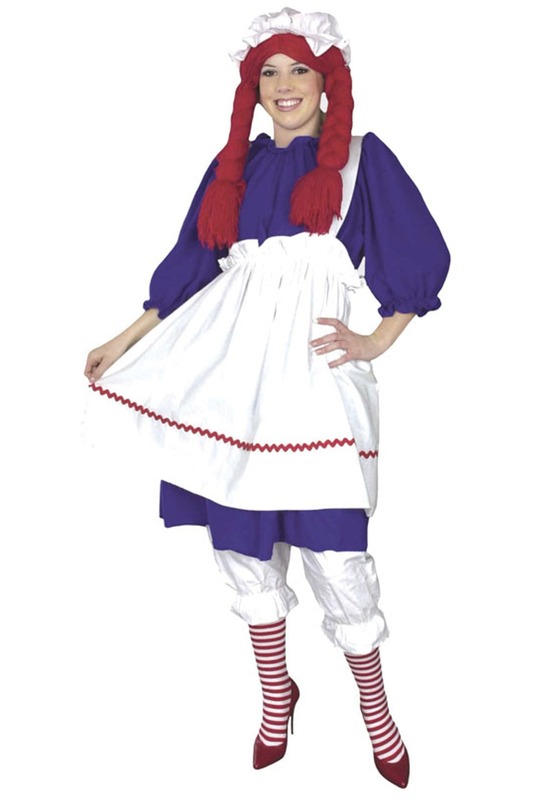 This huggable costume is the perfect outfit for looking like a cuddly classic-style rag doll, with puffy sleeves and bloomers to make you look like a plush, old fashion favorite. Slip the bright white pinafore on over the blue knee-length dress, and add a pair of black or red baby doll shoes and a red knit rag doll wig to wear under the included cap to complete this look. You'll feel like a kid again once you're dolled up in this nostalgic outfit!